I will be off-island until Sunday, November 17th. In the event of any breaking news stories Bill Cashman, of the Beaver Beacon, has generously agreed to post them on the Forum since I will not have access to a computer while I'm gone. Thanks so much, Bill. On Thursday, November 14th, the 180-foot, black hulled Buoy Tender Acacia appeared at the mouth of the harbor where they lifted the buoys, checked and placed them into the navigation areas. The Acacia is stationed in Charlevoix, Michigan near the Beaver Island Boat Dock. It has a beam of 37 feet with a draft of 12.7 feet. Displacement is 1,025 tons and she's powered by two diesel engines. It's a bouncing baby boy for Craig and Danielle Petrak. Chase Owen weighed in at 8 pounds 2 ounces. Grandparents are Debbie Alsko of Grand Rapids, Dan Cruickshank of Beaver Island, Curt and Joan Petrak of Gladwin, Michigan. Great grandparents are Bud and Barb Cruickshank of Beaver Island and Jane and John Mushong of Gladwin, Michigan. Congratulations to all! United States Coast Guard helicopters from Traverse City, Michigan and aircraft from the Civil Air Patrol are currently conducting searches for an aircraft that is missing somewhere between Fond du Lac, Wisconsin and Beaver Island. The aircraft is a Cessna 175 with the tail number N7091M. Reported aboard are Melvin Bellamy and his wife, Judy, from Beaver Island. The Bellamy's were returning to the island after attending a Marine Corps Ball in Missouri. They were last seen fueling their Cessna in Fond du Lac at 4:42 p.m. central time on Sunday. The flight time from Fond du Lac to Beaver Island is approximately two hours. Mel, Judy and their family are in our thoughts and prayers as are all those who are out searching for them. UPDATE as of 8:45 a.m. Tuesday, November 12 There is still no sign of Mel and Judy's plane. The search by a Coast Guard helicopter started shortly after an overdue plane called was logged around 2 p.m. Monday. 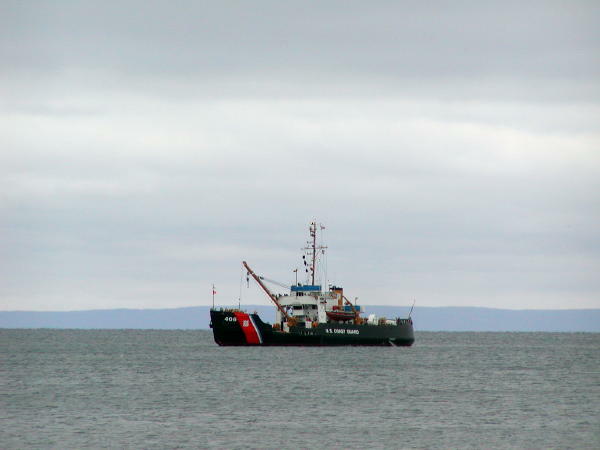 The search focused near Summers Island, southeast of Escanaba, according to BM1 Monte Wilson of the Coast Guard. Paul Welke, owner of Island Airways, has also been out searching the outer islands. Coast Guard and Civil Air Patrol are checking the flight path normally used by Mel. UPDATE as of 1:30 p.m. Tuesday, November 12 The Coast Guard has resumed the search for the Bellamy's plane after receiving a new report on the aircraft's last know position. Yesterday the focused the search around Summer Island near Escanaba. The new search area is five miles west of Point Detour off Big Bay De Noc near Green Bay, Wisconsin. It will also include a land search in the area of Fairport, Michigan. A citizen of Fairport reported seeing an aircraft matching the description of the Cessna flying at treetop level heading North-Northeast on Sunday evening. On Monday, rescue helicopters from the Coast Guard Air Station Traverse City searched more than 1200 nautical miles. Mel, a Vietnam veteran and former Marine, an experienced pilot had flown this route often, traveling to Missouri to counsel young soldiers awaiting assignments and new recruits. UPDATE as of 6:45 p.m. Tuesday, November 12 The search for the Bellamy plane has been suspended and the Coast Guard is not planning any further search operations at this time. The Federal Aviation Administration has the plane, a Cessna 175, registered to Judy Bellamy. Mel holds a commercial pilot's certificate with ratings for single-engine over land and sea, multi-engine over land and for flight instrument flight. UPDATE as of 8:30 a.m., Wednesday, November 13 Although the Coast Guard has called off its search for the Bellamy plane, today the Civil Air Patrol pilots will continue to look for some sign of it. Petty Officer Second Class Paul Roszkowski, spokesman for the U. S. Coast Guard 9th District, stated for the Record Eagle, that "Due to survival time in the water and the fact that this case was reported to us around 20 hours after they were overdue, the chance of survival is nothing by now if they went down in the water. If they went down on land, though, it's a different story. ... With this particular case, there's nothing that points to the fact that the aircraft went down near Beaver Island, and for that matter, there's nothing that points to the fact that it even crashed, because unless we find some wreckage, it's listed as a missing aircraft. Our search would've been more defined had he filed a flight plan instead of searching the whole lake, we could be searching the specific area where we knew he'd planned to fly." Our thoughts and prayers continue for Mel and Judy's children; Missy, Jenny and Mike, their grandchildren, for Mel's brother Dale, and for all their family. Miracles DO happen as we remember a missing plane where an entire family survived despite terribly cold weather. May Mel and Judy encounter the same kind of miracle. UPDATE as of 3:30 p.m., Thursday, November 14 No news to report so far. The Civil Air Patrol is continuing to search for the plane. Notice to deer hunters... please keep your eyes open for the plane if you're hunting in the areas that may have been in the Bellamy plane flight path. Departing Beaver Island at 8:30 a.m. Departing Charlevoix at 11:30 a.m. Departing Beaver Island at 11:30 a.m. Departing Charlevoix at 2:30 p.m.
Today, while working at the Beaver Island District Library a young girl arrived with her father to use the copy machine to make signs which they posted around town. It seems that Nichol Parker's much loved dog, a Jack Russell terrier is missing. Nichol is offering a reward for his return. Asked to describe him she says, "half of his face is reddish brown and the other half is white. He had spots on his back and some of them are black. He has a curly tail and is pretty big. He is wearing a blue collar and has tags." If anyone sees Nichol's dog, please call 448-2297 or 989-224-4985. UPDATE Nichol's dog was found visiting the Dawson's on the West Side. He knew the right home to stop at.